LONGMEADOW, MA – Observing Workers’ Memorial Day, a coalition of safety groups has released the U.S. Worker Fatality Database, with accompanying maps and infographics. The database, which shows the names, people, and stories behind statistical reports of deaths on the job, is the largest open-access data set of individual workplace fatalities ever collected in the United States. 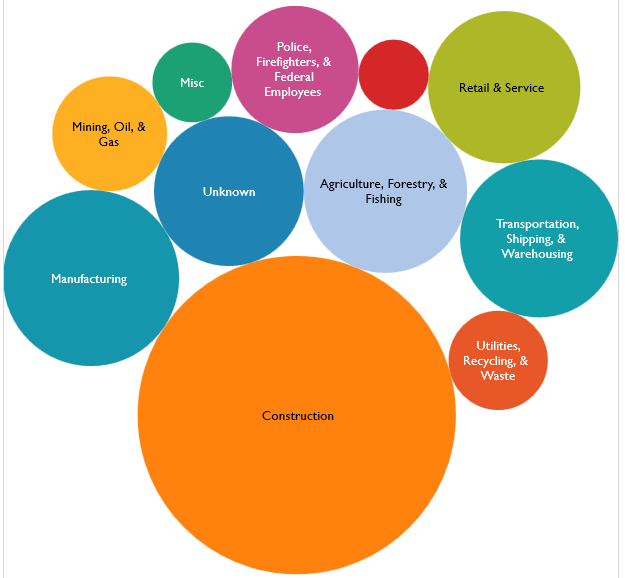 U.S. Worker Deaths by Industry, 2014. Available through the map and infographic function of the U.S. Worker Fatality Database. Data can also be mapped by state. The U.S. Worker Fatality Database identifies more than 1,780 workplace fatalities in 2014, with additional data still being collected. Based on previous data, this is likely to represent over one-third of the total cases of workplace deaths from traumatic events for that year. The final toll for 2013, released last week by the U.S. Bureau of Labor Statistics, is 4,585 deaths on the job from sudden traumatic events. An additional 50,000 workers are expected to die each year from long-term exposure to toxic chemicals and other occupational hazards. The U.S. Worker Fatality Database was created when workplace safety advocates, seeking information about workers killed in their state, region or local community, found that important details about these tragic cases were not consistently available. The resulting database offers more specific detail than the annual Census of Fatal Occupational Injuries from the BLS, which reports aggregate statistics. The U.S. Worker Fatality Database includes, where available, the name of the deceased, employer, circumstances of death. It contains links to sources of public documents related to the incidents on how and where workers were killed, including OSHA reports and news media accounts. The data can be sorted by age, gender, city, state, industry and keywords such as “fall elevation,” “electrocuted,” “explosion” and other terms linked to the cause of death. Using the accompanying map function on the Tableau Public platform, maps showing the incidence of fatalities can be zoomed and captured by industry and by individual states. These maps are licensed under Creative Commons, and can be modified, reproduced and redistributed, with credit to: U.S. Workers Fatality Database. Workers’ Memorial Day, which coincides with the day the Occupational Safety and Health Act took effect in the United States in 1971, is part of a week-long series of activities across the country to honor workers who have died on the job and advocate for better safety protections. Workers’ Memorial Week is being observed this year in more than 100 local communities with vigils, rallies, marches and other events. A full listing is available on the National COSH website. National COSH links the efforts of local worker health and safety coalitions in communities across the United States, advocating for elimination of preventable hazards in the workplace. “Not an Accident: Preventable Deaths 2015,” a National COSH report, describes workplace fatalities in the United States and how they can be prevented. For more information, please visit coshnetwork.org. Follow us at National Council for Occupational Safety and Health on Facebook, and @NationalCOSH on Twitter.